See the 2010 site, access routes and Satnav targets in the unique GlastoEarth map. Following last year's severe traffic problems, the festival organisers have planned a raft of new measures aimed at making life easier for festival goers and locals in 2010. On the first day of the festival last year traffic swamped approach roads and caught the organisers and police by surprise. By the end of the Wednesday 45,000 vehicles and 90,000 visitors were on site, compared with 60,000 the previous years. Both the police and organisers attributed the rush to the weather - forecast to be hot and sunny for the first few days, before declining into rain. This year, representing a first for a major UK event, the new license proposal plans for car parks to open the previous evening, at 9pm. Organiser Michael Eavis has promised that catering and toilet facilities will be laid on for those spending the night to beat the traffic. Campervan fields will open even earlier, at midday on the Tuesday. If the plans go ahead, long queues at the pedestrian gates should be expected when the festival opens at its usual time of 8am Wednesday. The plan also includes new access routes to car parks. The two existing routes into the east car parks will be bolstered with a third 'cross-field' route that will allow southbound traffic on the A37 to feed in at a rate of up to 800 vehicles per hour, operating during peak hours. The west car parks will add a new gate, aimed at avoiding conflict between traffic and pedestrians crossing the A361 from the outermost car parks north of the road at Whitelake farm. The White Route is also likely to be extended to feed the new west campervan fields. Further afield, additional 'variable message signs' will be set up, giving traffic and route information to drivers heading in to the festival. Those wanting to cross between east and west sides on their approach will be encouraged to use major roads far outside the festival area, in order to reduce the bottleneck around the festival perimeter. 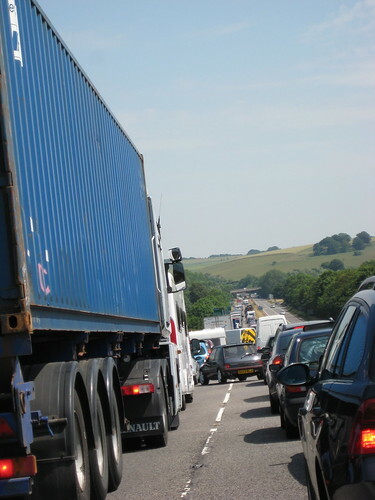 Suggested routes will include the M4, M5, A303 and A358. In recognition of the growing use of satellite navigation systems, the organisers will be publishing four targets - North, South, East and West - that will lead vehicles to the best approach routes for the festival, and reduce the number of vehicles causing congestion in the local lanes. Whilst last year was a test of patience for those arriving on Wednesday, the car park exit times are already greatly improved. The license proposal recognises a reduction of reported 'longest wait' time, down from eight hours to two hours last year, as festival goers became more informed about avoiding the peak exit times. The plan also caters for the problems experienced by those arriving by train last year. Wednesday's traffic snared the shuttle buses in 2009 which lead to a domino effect on rail services. Crowding at Castle Cary station resulted in trains being stopped on the line from London Paddington. This year, in addition to the other mitigation plans, the organisers propose the option to close the road from the station to all but the shuttle buses, should heavy congestion still occur on this route. The package of measures detailed in the licence proposal is subject to approval by Mendip Council, understood to be decided during March. The deadline for local feedback closed today. A full traffic management plan is due two months before the festival opens.